It is important to break up emptiness, to disrupt vacant spaces to, to give our visual foothold something solid to stand on. 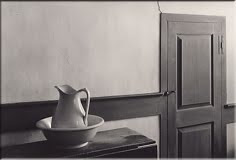 As I studied this George Tice image today it was the broad and solid wood detailing on the wall that made this image work for me. Dad, what is this feature referred to as? Also when I was in Telluride with Glenn Oakley I noticed a lot of the hotels and "cabins" utilize "stepped" mini roof lines that parallel the main roof line. Seems like they were used to break up the empty expanse of multi story exterior walls. Often times these min roof lines originated from a window on the side of the building. What are those features know as? I've always appreciated wanes coating in a room, dormers in a roof, solid crown molding and blocky base board in rooms with elevated ceilings. Think about Susan Susanka's concept of dilineating different living spaces with something as simple as an exposed header or a change in the finish floor elevation. Emptiness and empty expanses must be broken. As visual creatures, as fragile humans we need something solid on which to ground ourselves. Other than the fact that they can't risk someone hurting themselves, I've never understood what good it does to put a lunatic in small, featureless, flat, white rooms. Seems like it would me more harmful than beneficial, creating a sense of panic, a sense of lost orientation and direction. The empty canvas, the blinking cursor, an empty wall or ceiling, are all terrifying. We need visual, metaphorical, physical, ideological anchors from which we can send out skiffs, explore, create, then return to and lean on for support.